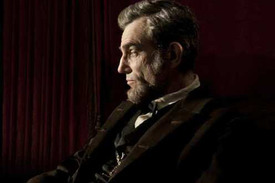 A restrained Steven Spielberg tackles his long-gestating historical document, Lincoln, with intelligence, verve and style in a film that's not afraid to express ideas without plugging in an action sequence every ten minutes. Focusing on President Abraham Lincoln's last days in office as he attempts to push through the 13th amendment abolishing slavery, thus ending the Civil War, this is not really a biopic of the great President as the title might indicate, but rather a fascinating, savvy look at the inner-workings of the political process and how things in the White House get—or don't get—done. Remarkably relevant to today's political environment, Lincoln lets Spielberg and his ace screenwriter Tony Kushner (Angels In America, Munich) prove the worth of a smart, riveting and dignified drama. If people don't perceive the film as the equivalent of a civics lesson, the box office should be uncommonly strong for a historical film that is long on words and short on epic awe—except for the occasional battlefield scene. Kushner spent years in development trying to find the right tone for Spielberg's long-planned Lincoln movie, and it almost wasn't made until a narrower focus prevailed by convincing the filmmakers to zero in on the President's efforts to get the 13th Amendment through a widely divided congress. With his nascent Republican party facing enormous opposition from the Democrats, Lincoln uses every his every power of persuasion to push through this then- unpopular idea, even to the point of using "vote buyers"—a trio of almost comical men (James Spader, Tim Blake Nelson, John Hawkes)—twisting arms any way they can. Chief among the protagonists is Thaddeus Stevens (a scene-stealing turn by Tommy Lee Jones ) whose strong belief that all men and women are created equal leads to some of the film's most pungent and even amusing scenes. Also standing out in the large cast is David Strathairn as Lincoln's Secretary of State who spends a great deal of time counseling the President. as well as Francis Preston Blair, the founder of the Grand Old Party, played with relish and authority by Hal Holbrook. As all the politicking is going on with Congress, Lincoln's personal life is also in chaos with several wrenchingly emotional scenes for Sally Field—terrific as Mary Todd Lincoln—who is still grieving over the loss of their child, and dealing with two other sons, Tad (Gulliver McGrath) and Robert (Joseph Gordon Levitt), the latter of whom drops out of college to enlist in the Union army against his father's fervent objections. While these scenes have great value, they aren't at the center of Lincoln—where the picture truly comes alive is in the fascinating inside look Spielberg and Kushner (working from Doris Kearns Goodwin's 2005 book Team Of Rivals) give us into the political process of the Lincoln White House. The most vibrantly engaging scene is the free-for-all when the big vote is taken, making later scenes revolving around Lincoln's assassination (not specifically shown) almost anti-climatic. As you might expect, Day-Lewis is exceptionally fine. He looks like he just walked off the five dollar bill, except he's got too much gravitas for a two-dimensional portrait. His vocal choice, while a bit startling, is said to be historically accurate, which adds to the film's credibility. Lincoln is a very polished production with a welcome lack of flash. In this era of outlandish campaigning, it's nice to cut through the hype and get real substance and insight into a politician.